Home Ask Shelly	Ask Shelly: Which car seat compatible stroller for travel to Paris with a baby? Ask Shelly: Which car seat compatible stroller for travel to Paris with a baby? My name is Alexandra, I am planning to travel to Paris in July, so I will need a lightweight stroller. My baby will be 8 months by then. In the meantime I have a Bugaboo Chameleon which is breaking my back (so heavy and difficult to handle when you have a C-section!) and I have a Peg Perego carseat. I saw the Peg Perego Vela at Babies R Us and found it really smooth and convenient, also liked that it is car seat compatible. The only thing I was not sure about was the folding measurements, Maclaren Quest folds smaller and easier… Do you have any feedback for the Peg Perego Vela? I’ve been considering the Peg Perego Vela for my list of recommended lightweight travel strollers, but I haven’t decided yet (if any of you have experience with it and want to share your opinions please post below). That it only weighs 10 lbs., has larger rolling wheels which help a lot on bumpy terrain, AND is compatible with a very popular infant car seat are definitely in its favor. I also like the large, accessible storage basket and child’s tray—two things you don’t often get with a lightweight travel stroller. However, when it comes specifically to taking the Paris Metro with its many stairs and generally getting around the city with a stroller—during which time you probably won’t have any use for the car seat—this may not be your best bet. To answer your question, the Vela folds to 39” x 23” x 12” deep, whereas the Maclaren Triumph (weighing 1 lb. more) folds to 10” x 10” x 41” and includes a shoulder carrying strap, making it a much easier package to wear through turnstiles and tote up and down stairs as needed, while keeping your hands free for tickets and/or baby. Some other lightweight travel strollers with shoulder carrying straps: Combi Savvy (and other lightweight Combi travel strollers), UPPAbaby G-luxe. We did well in Paris with a Combi Savvy ourselves, in spite of the small wheels (also like the Triumph with rubber wheels). With the exception of the Savvy, which I was sometimes able to insert our infant car seat into with the stroller seat fully reclined, most of these strollers aren’t made to carry infant car seats. The lightweight Combi Flare, however, can be used with the Shuttle car seat. If you really like the modern / streamlined design and want the flexibility of snapping that car seat in sometimes, you might also consider cashing in your Bugaboo and going with the Quinny Zapp, the most compact folding stroller I know. You could actually buy this whole travel systm / bundle, including the compatible Maxi-Cosi car seat , with what you might get for resale on the Bugaboo (and still have money left over for pan au chocolat). What about the rest of you? Have you seen Paris by stroller? Share a comment below! BTW, that’s mon homm pictured in Paris with our babe in the Combi Savvy—which he swears is still his favorite of the travel strollers we’ve tried. Ask Shelly: Advice on travel beds for twins? Ha! I was about to write and tell our experience with the city mini jogger and I see she bought one! I wonder how she went? We took our tall four year old to Europe with a city mini and it was fantastic! We caught trains all over the place from Germany right down to Sicily and it was great to be able to have something that was so easy to just fold up and carry it by its handle when there were stairs (and there are lots) or get it thru a train turnstile, use on all types of terrain, from cobblestones to walks around the lakes, our tired, out of routine often child slept in it as it fully reclines and has a great hood. It’s not light like a umbrella stroller but is light by 3 wheeler standards and its not too heavy to carry either. Plus it has a large basket underneath. It’s now being used by our second child! I just came back from testing strollers and I completely fall in love with the City Mini by Baby Jogger. I am willing to sell my bugaboo and have this as the only stroller. My baby loved it too! My only concern is the width of the back wheels: 24" wide (60 cms), versus the Maclaren which is 17"…(40something cms) I measured them… I remember the streets of Paris sometimes with stuff from the stores, like fruit stands, tables from restaurants, etc… that would be my only concern… for the rest I think I am posting my bugaboo on Craigslist tonight! Thank you all so much for your comments. Still haven't decided yet and the date is approaching. 3.- The new 2010 Bumbleride Flite: very similar in price and features to the Quest, plus has dual front and rear wheel suspension, really nice colors, and a better canopy. I would like to try the last 2 before making the purchase, but I haven't find a store nearby that sells them yet… Will keep you posted. Peg Perego Vela is a very great stroller for the young children. This is a great tool for toddlers safety while traveling with the kids for sure. I will not comment on specific stroller models…as most of the ones you mention here are not sold in here. 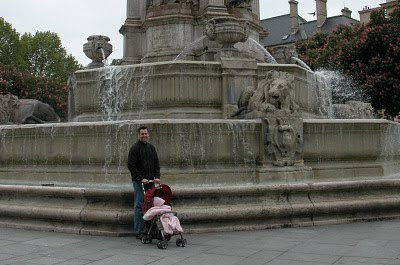 But I can advise on stroller usage in Paris, as I leave here and practice every day ! As you'll use public transportation you'll definitively need a light stroller. The Parisian metro does not offer much escalators or lift, you'll have to carry the stroller (and the baby !) in stairs. We however recommand to do same way as Parisians = use bus network instead ; network is dense and much easier with a stroller (you'll find a dedicated space for stroller inside) ; Paris is now full of bus lanes, and buses don't get stuck in traffic jam anymore (as it was few years ago). Re car seat: if you plan to take a taxi, your car seat will be needed, as taxi drivers don't have any in the cars. Anyway, welcome in Paris and hope you'll enjoy you're stay here ! Oops! Meant to write Triumph, not Volo. I can't speak to a light weight stroller that will take a car seat. Since you probably won't want to drive in Paris, (I definitely couldn't recommend it) anyhow, why not opt for a light weight umbrella stroller? Especially since at 8-months your little one will be close to out-growing that car seat anyhow? We love, love, LOVE our UppaBaby G-lite. We traveled with it in New Zealand for 3 weeks this spring and have nothing but great things to say. It's the lightest umbrella stroller on the market, won't break your back if you happen to be tall, stands when folded, has a shoulder strap that will come in very handy on the metro and shocks that keep it rolling over cobblestones. Plus, it has what is in my mind THE greatest feature any stroller could come with. The padded seat is actually velcro-ed to a mesh seat. If, for any reason, the padded seat should get dirty (as things that are around babies/young children tend to do!) you simply TAKE IT OFF AND WASH IT. And, because there's a mesh seat behind it – you STILL HAVE A WORKING STROLLER! Baby manages to pee all over the thing in the middle of the day? Take it off, shove it into those gallon sized ziplocs you already have for wet clothes and YOU'RE DONE! BEAUTIFUL! My husband was not convinced about the beauty of this feature till the SECOND time we used it – in ONE week! LOL. Paris hotel rooms tend to be tiny. An umbrella stroller takes up less room and will be small enough to use as a highchair while you're in your room.